Jefferson wanted to get a quick start, but the Dragons' opening inning was more than they imagined. 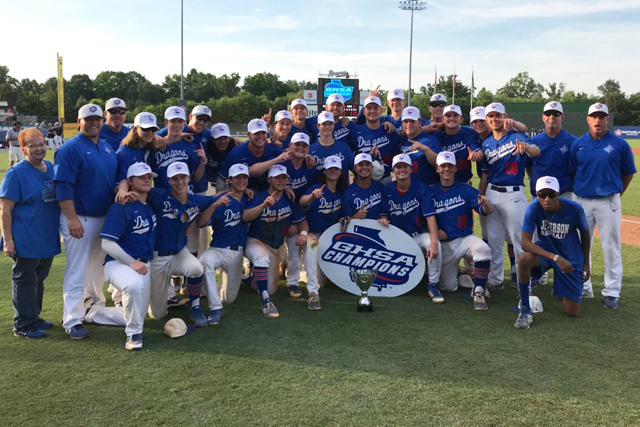 In Game 3 of the Georgia High School Association Class 4A state championship series Wednesday at State Mutual Stadium in Rome, the Dragons scored five runs in the top of the first inning and never looked back, beating Cartersville 6-3 to win the best-of-three state championship series. It was Jefferson's first state championship in school history. And the Dragons (28-12) did it with the same formula they've used to win all season -- solid pitching and an opportunistic offense. After a hit batsman forced home the game's first run for Jefferson, they erupted for four more courtesy of a two-run double by Clayton Jones and an RBI single by Sam Elegreet to take a commanding 5-0 lead. Cartersville (32-10) cut the deficit to 5-2 with a run each in the third and fourth innings. Jefferson added an insurance run on an error to make it 6-2 in the top of the seventh before Cartersville attempted a rally in the bottom of the inning. Anthony Seigler cracked a solo homer to cut Jefferson's lead in half. Later in the inning, doubles by Jake Gooch and Josh Davis put runners at second and third before Game 1 winner Patrick Hickox, who worked the final three and two thirds innings in relief, got the final two outs to record the save. Cartersville outhit Jefferson 7-5 but also had two errors. Jefferson pitcher Vinny Wood earned the victory on the mound. He was relieved by Will Wood, who worked one and a third innings before yielding to Hickox. Cole went 2 for 3 to lead the offense, while Jones finished with two RBIs.